Afghanistan are ready to collide with Ireland tomorrow in the third ODI at Rajiv Gandhi International Cricket Stadium. After the second match was washed out by rain, both the teams would be eager to perform when the action resumes in the upcoming game. 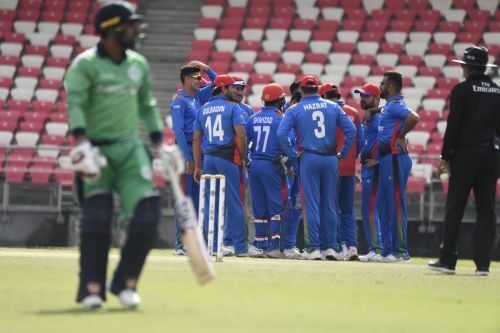 Ireland will be desperate to get their first victory of this Indian tour while Afghanistan would be eying to build an unassailable lead of 2-0 heading into the third ODI. We are in for another thrilling encounter between two dark-horses in the world of cricket. Afghanistan have been in exceptional form to remain unbeaten in this Indian tour. They have dominated both the series so far while outplaying the Irish side in all the three departments. Having clinched the T20I series by 3-0, the Afghans would be determined to keep their winning momentum rolling. Their explosive batting lineup and lethal bowling attack have turned out to be too good for the visitors. With the ICC World Cup in sight, Afghanistan look well-equipped and poised for the mega event. On the contrary, Ireland are having a tough time as they are still winless in this tour. The string of defeats has proved once again that they have a long way to go in the International circuit. Having been hammered in the T20I series, Ireland would be hoping to bounce back in this series. Though Ireland may seem battered and bruised, they can perform well in the remaining matches to boost their team morale. The visitors will be desperate to spoil Afghanistan’s party and end this horrible tour on a high. Ireland can make some changes in the starting XI ahead of this crunch game. James Cameron-Dow might be dropped from the team. Md. Nabi will play in the upcoming as he has recovered from his injury. Afghanistan is expected to field an unchanged playing team.